· Calendar: This is the accounting calendar; this might be different from the workday calendar. · Currency: Each SoB has unique functional currency. Transactions can be enetered in multiple currencies which can be converted later. · Chart of Accounts: Each SoB has unique chart of Account which represent the set of accounts that related to the Inventory, Purchasing and Account Payables. This can be defined as the legal company for which fiscal or tax report can be prepared. A SoB can have multiple tax entities. This is a division. A corporation can be divided considering its operation. For example, a computer manufacturer may have separate divisions for Laptop, personal computers and Servers. The Laptop can be represented by one operating unit, which is having its centralized purchasing and ordering function. The physical part, which is Inventory may have received in separate inventory organization but the purchase orders are maintained centrally in an operating unit to optimize the supply chain. Operating units affects transactions involving in order management, purchasing, payables and receivables. This can be manufacturing facilities, warehouse or any facilities where a company stocks and transacts inventory. 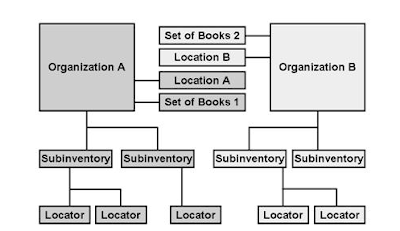 In Oracle Application, these are the physical locations within a manufacturing or warehouse facilities where goods are stocked and transaction takes place from here. These are created inside Inventory Organizations. Each Inventory Organization must have at least one location.